If you want your office to look modern, sleek and streamlined, but make no compromises on comfort or luxury, then you need our Mesh office seating. Redefining the health-conscious work environment, Mesh office seating offers greater posture control and firmer support, customisable for every user. With the Enjoy mesh chair collection, we have brought economy together with luxury. Sounds impossible? 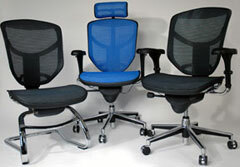 You will be amazed at the comfort and support offered by these quality chairs. Enjoy shares many features with our top-of-the-line Ergohuman models, including adjustment controls for that customised comfort. Enjoy delivers precision engineering, beautifully designed to provide enduring comfort. Crafted with the concept of all humankind in mind, the Ergohuman mesh chair fuses art and science, with flex zones delivering constant back and lumbar support, multi-dimensional adjustable armrests for unparalleled support and height-adjustable pivot headrest for full cranial support. The Ergohuman mesh chair has been designed specifically for those who have to sit in an office chair for long periods, requiring 'Intensive Use Seating' to keep comfortable while working. Aesthetics, form and function enable this clever ergonomic chair to adjust to every form using a synchro-tilt mechanism with infinite lock, a sliding seat, pneumatic height adjustment and automatic lumbar support system. 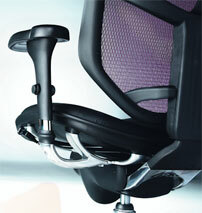 This unique ergonomic chair also has height and angle adjustable arms and headrest. The Ergohuman's revolutionary automatic lumbar support system provides support in various seating positions without the need for manual adjustment. 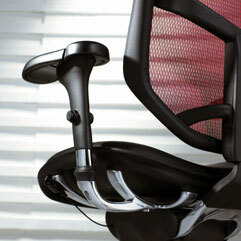 No other office chair on the market today offers such a system.